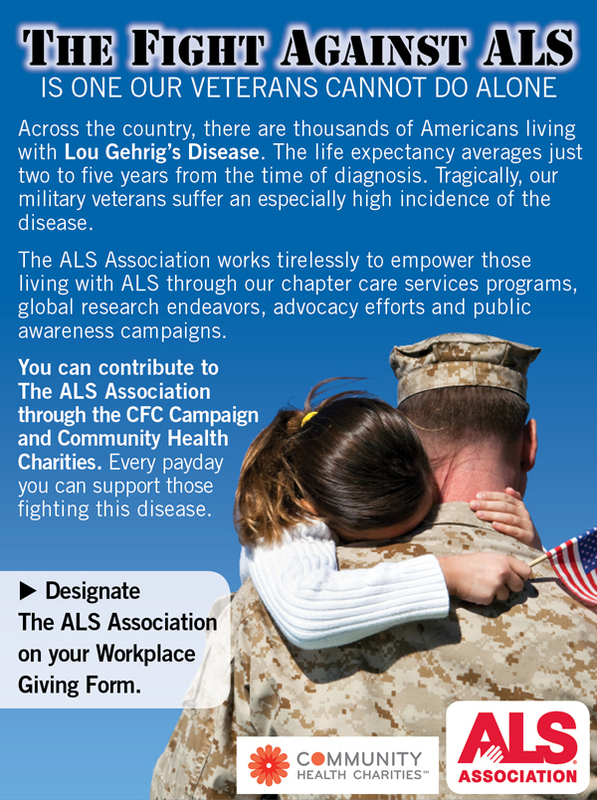 Workplace Giving is an easy way to support The ALS Association Golden West Chapter. Your gift supports patient service programs in thirty-one counties in California and the state of Hawaii and more than 90 research projects throughout the world. Giving at work through payroll deductions is simple and there are many convenient ways to contribute. As a member of Community Health Charities of California (CHCC), we are one of the voluntary health agencies participating in the Combined Federal Campaign (CFC) and California State Employees Charitable Campaign (CSECC). Federal and state employees and members of the military are encouraged to participate in the CFC and CSECC and may designate The ALS Association Golden West Chapter by writing it on the Workplace Giving Form. If your company is eligible, check with your human resources or community relations department, and ask for the proper form to request that your company match your gift. Some companies match gifts made by retirees and/or spouses! Even if your company isn't listed here, check with your Human Resources Department to see if they have a Matching Gifts Program. The ALS Association is recognized as exempt from federal income tax under section 501 (c) (3) of the Internal Revenue Code and is registered under statutory laws throughout the U.S. Gifts to The ALS Association are fully tax-deductible to the extent allowed under the Internal Revenue Code. The ALS Association's federal tax ID number is 91-1758788.